Hearts and flowers in the bluebell season. Instructions for Crew Neck Version. Instructions for 5 sizes - larger sizes are shown in brackets. When working the colour pattern from the chart, strand yarn not in use loosely across the wrong side of the work over not more than 3 stitches at a time in order to keep the fabric elastic. Read odd rows knit from right to left, and even rows purl from left to right. The chart is included with the pattern instructions below, but for a larger version of the chart you can right click >>here<< and choose "save link as" or "save target as" (browser dependent options) to download and save a pdf file. If you want to view chart image full size in the browser then right click on the image below and choose "view image". 2nd row: p1, * k1, p1; repeat from * to end. Next row: Rib 8 [4, 8, 10, 5] m1; (rib 15 [8, 11, 19, 10], m1) 3 [7, 5, 3, 7] times, rib to end. (65 [73, 77, 81, 89] sts). 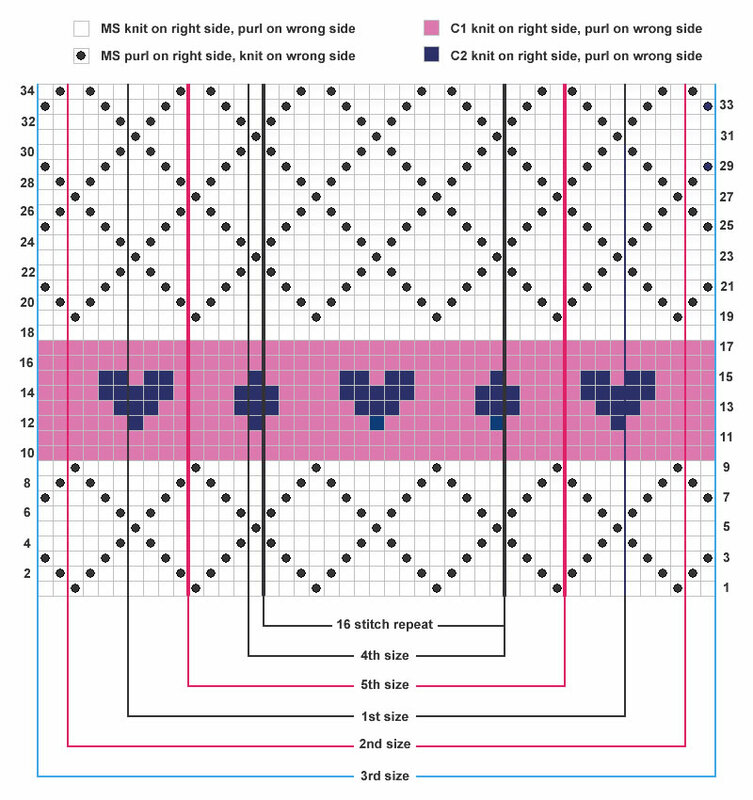 Change to No 8 (4mm) needles and work 34 rows in pattern from the chart, working the first and last 8 [12, 14, 0, 4] stitches of each row as indicated for each size, and working the 16 stitch repeat pattern in between. After completing the first 34 rows, work a further 6 [18, 26, 38, 40] rows in the pattern thus ending with a 6th [18th, 26th, 4th, 6th] pattern row. Keeping the continuity of the pattern, shape raglans by casting off 4 stitches at the beginning of the next 2 rows. Decrease 1 stitch at each end of the next and following 4th row. ( - [-, 65, 69, 77] sts). Decrease 1 stitch at each end of the next and every alternate row until 23 [25, 27, 29, 31] stitches remain. Leave remaining stitches on a spare needle or stitch holder. Work as for Back until 37 [43, 45, 47, 49] stitches remain in raglan shaping, ending with right side facing for next row. Next row: k2tog, pattern 11 [13, 14, 14, 15], turn, and leave remaining stitches on a spare needle or stitch holder. Continue on these 12 [14, 15, 15, 16] stitches for the first side, decreasing 1 stitch at the neck edge on every row, and at the same time decreasing 1 stitch at the raglan edge on every alternate row until 6 [8, 8, 8, 7] stitches remain. Work 1 [1, 0, 0, 1] rows. Decrease 1 stitch at the raglan edge only on he next and every alternate row until 2 stitches remain. Next row: k2tog, and fasten off. With right side facing, slip centre 11 [13, 13, 15, 15] stitches on a length of yarn or stitch holder, rejoin yarn to remaining stitches, pattern to the last 2 stitches, k2tog. Work to match first side, reversing shapings. With No 10 (3¼mm) needles and MS, cast on 31 [31, 39, 39, 39] stitches and work in rib as on back for 5 [5, 6, 6, 6] cm, ending with a 1st row and wrong side facing for next row. Next row: Rib 8 [8, 10, 10, 10] m1; rib 15 [15, 19, 19, 19], m1; rib to end. (33 [33, 41, 41, 41] sts). Change to No 8 (4mm) needles and joining in and breaking off colours as required, and starting with a 19th row, work in pattern as for 1st [1st, 2nd, 2nd, 2nd] size of the Back at the same time shaping sides by increasing 1 stitch at each end of the 3rd [7th, 3rd, 7th, 3rd] and every following 6th [7th, 12th, 14th, 12th] row until there are 49 [49, 53, 53, 57] stitches, taking the increase stitches into the pattern. 1 [1, 1, 1, 1], C2. * may be only one ball of C1 required for all sizes if working the collared version. Pair each No 7 (4½mm), No 8 (4mm), and No 10 (3¼mm) needles. 23 stitches x 30 rows to 4 ins (10cm) in stocking stitch on No 8 (4mm) needles. sleeve seam: 9½ [11, 12, 14, 15½] inches, (24 [28, 31, 35, 39] cm). sl1: slip one stitch by passing it between the needles without knitting it. 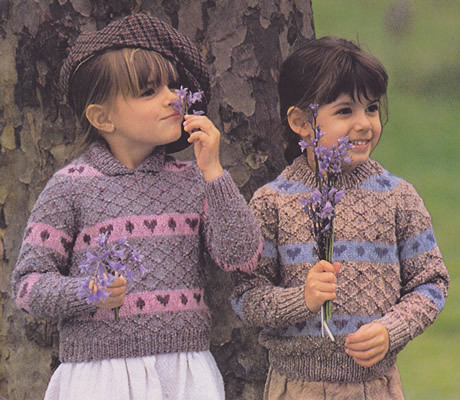 The original yarn was Patons Moorland Tweed/Shetland double knitting. Moorland was 100% wool with a suggested yardage of 137 yds (125m) - although this was not printed on the ball bands at that time. A similar substitute might be Rowan Felted Tweed DK. "Always check your tension" [Good Advice]. Continue in pattern until sleeve seam measures: 9½ [11, 12, 14, 15½] inches, (24 [28, 31, 35, 39] cm), ending with the same pattern row as on the Back at the start of the raglan shaping, thus ending with right side facing for next row. Decrease 1 stitch at each end of the next and every 4th row until [33, 37, 35, 37] stitches remain. Decrease 1 stitch at each end of the next and every alternate row until 7 stitches remain. Leave remaining stitches on a safety pin. With wrong side of work facing, block each piece by pinning out round edges, and omitting ribbing, press parts lightly on wrong side following instructions (if any) on the ball band. Join raglans, leaving left back raglan open. With right side facing, No 10 (3¼mm) needles, and MS, k7 from left sleeve, pick up and knit 12 [12, 16, 16, 16] stitches down left side of neck, k11 [13, 13, 15, 15] from front, pick up and knit 12 [12, 16, 16, 16] stitches up right side of neck, k7 from right sleeve, then 23 [25, 27, 29, 31] from the Back, increasing 1 stitch at the centre. (73 [77, 87, 91, 93] sts). Starting with a 2nd row, work in rib as for the Back for 5 [5, 6, 6, 6] cm. Using a No 8 (4mm) needle, cast off loosely in rib. Join remaining raglan and Crew Neck seam. Fold Crew Neck in half to wrong side and slip-hem loosely in position. Join side and sleeve seams. Work as for Crew Neck Version but casting off stitches loosely at back of neck, front of neck, and top of sleeves. Join raglan, side, and sleeve seams. 1st row (right side): k2, * p1, k1; repeat from * to last stitch, k1. 2nd row: k1, * k1, p1; repeat from * to end. Repeat the last 2 rows once more then the 1st row again. Next row: Rib to last 2 stitches, turn. Next 2 rows: sl1, rib to last 2 stitches, turn. Next 2 rows: sl1, rib to last 4 stitches, turn. Next 2 rows: sl1, rib to last 6 stitches, turn. Continue thus until the 2 rows "sl1, rib to last 16 stitches, turn" have been worked. Continue in rib across all stitches until Collar measures 3cm at the side edge. Using a No 8 (4mm) needle, cast off evenly in rib. Sew cast-off edge of collar in position all round neck as in photograph.